This issue of Clinics in Sports Medicine, guest edited by Drs. Joe Hart and Stephen Thompson, will cover a variety of interesting topics surrounding Sports Medicine Statistics. 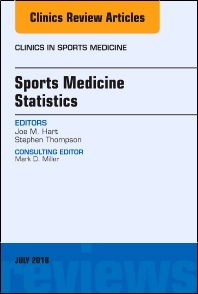 Subjects covered include, but are not limited to: Fundamentals of Sports Analytics; Statistical considerations for injury prevention in sports medicine; Mixed model designs for sports medicine research; Clinical Trials in sports medicine: design and analyses; Novel approaches to data presentation; Innovation in analytics – new methods in sports medicine; Patient reported outcome measures in sports medicine; Administrative Databases in sports medicine; and Lessons from the MOON: How to perform multicenter research in sports medicine.